I did it! I made ramen! To me, this is comfort in a bowl. 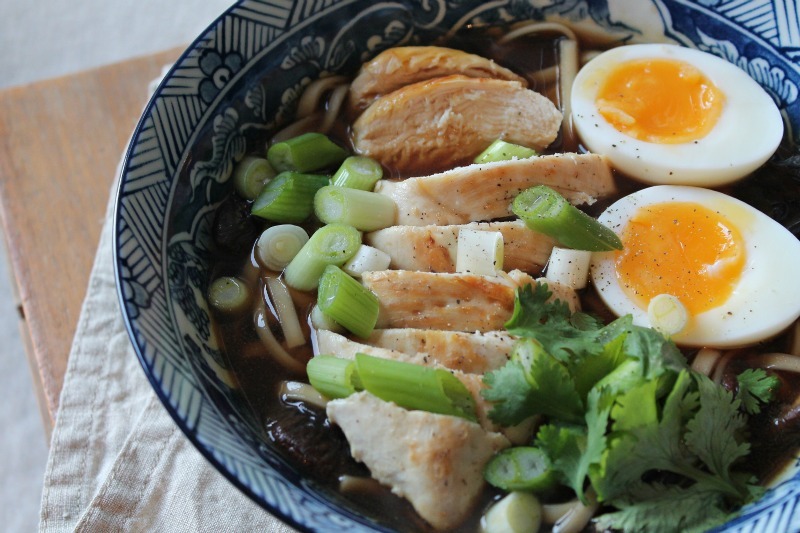 Chicken, noodles, perfectly boiled, runny eggs. I'd heard horror stories of ramen gone wrong and how it can take days to perfect those deep ramen flavours... so I was a little apprehensive to get started. 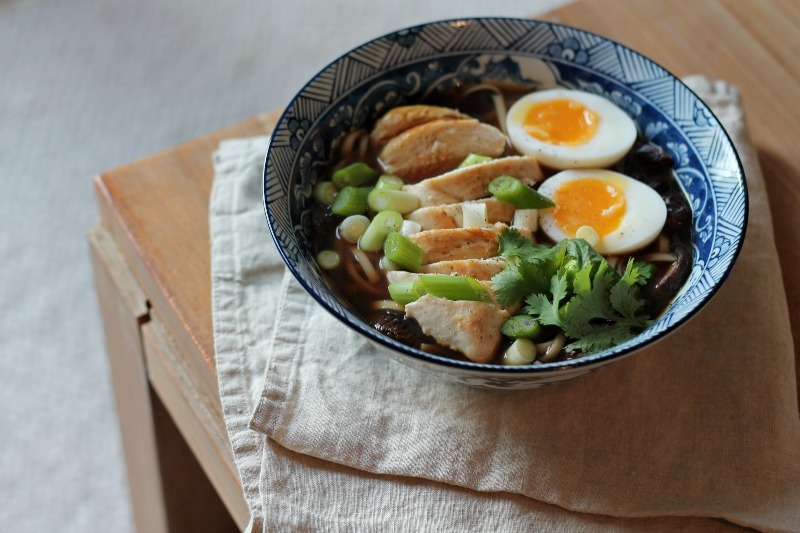 A simple chicken ramen recipe. After lots of pinning and recipe hunting, I found this seemingly straightforward recipe - too good to be true? Nope! Perfect, rameny loveliness. I've tweaked and made UK ingredients and measurement friendly. 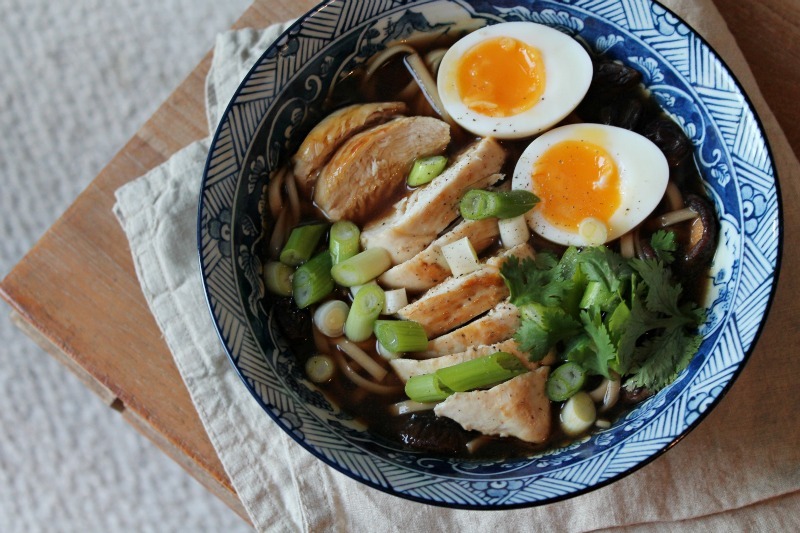 This makes enough ramen for two hungry folk. Start by frying the chicken in a non-stick pan to seal and brown the outside. A few minutes on each side is plenty, or until golden. Place in a tin foil parcel and cook in the oven for a further 15 minutes or until cooked through. You can add any chicken juices into your jug of chicken stock! In a large saucepan, fry the garlic and ginger paste on a low heat before adding the soy sauce and mirin - stir to combine. Add the stock and bring to the boil and simmer for 5-10 minutes. Add the dried, soaked mushrooms and simmer for a further 10-15 minutes. You may need to season to taste, however if you've used a dark soy sauce like I did, you probably wont need to. A light, lower salt soy sauce might be better to use in this. Whilst this is simmering, make your soft-boiled eggs! Bring a pan of water to the boil and then add the eggs carefully. I don't keep my eggs in the fridge, so they are at room temperature. Set a timer for 6 minutes. Once the time is up, remove from the boiling water and put into a bowl of iced water. This stops the cooking process. Leave in the icy water for 5 minutes before peeling and slicing lengthways. In the water you used to boil the eggs, cook your noodles. Follow packet instructions - usually 4-5 minutes. Assembly time. 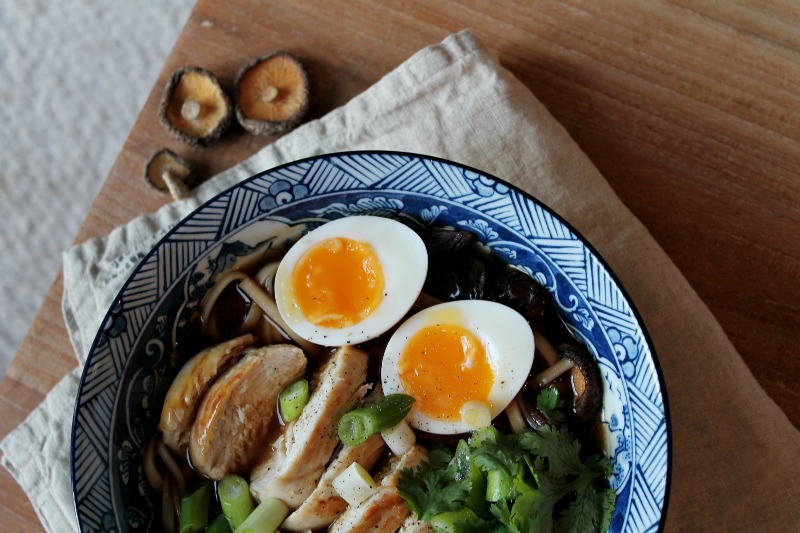 Pour the broth into two bowls then place the noodles, chicken breast (sliced), eggs and top with the spring onions (sliced) and a sprinkling of coriander. Season with black pepper and enjoy! I could gobble this up right now! I absolutely love ramen for a cold weekend, delicious!